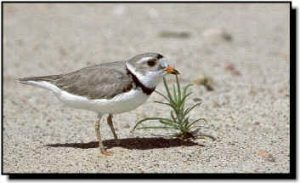 Comments: The piping plover is named for its clear, melodious “peep-peep-peeplo” call. The majority of nesting habitat for this bird in Kansas is on sandbars along the Kansas River. It usually lays 4 eggs in a shallow depression in the sand. The eggs are spotted and blend into the sandy background. Sand bars become too vegetated over time for suitable nest sites unless occasional floods scour them bare. The piping plover is well-camouflaged and difficult to see until it runs and stops in search of invertebrates. Like the more common killdeer, the piping plover feigns injury to lure predators away from its nest or chicks. Mated pairs often stay together for 2-3 years and return to the same sandbar they previously occupied if the habitat remains suitable. Piping plovers can live up to 14 years.